myHEALTHware Drive is available for preview in beta! myHEALTHware Drive will give clinic and patient users the ability to use a cloud storage system where health related data, such as care summaries, lab results, conversations between the physician and patient, immunization records, and any other document can be saved in this secure, HIPAA compliant storage space. Drive includes hierarchical, redundant, and secure, HIPAA compliant storage with an intuitive user interface that is seamlessly built into the myHEALTHware ecosystem. Rest easy knowing that you can securely access your medical files at anytime from anywhere! Store and save lab results, conversation attachments (images, PDF files, etc. ), and your clinical summaries in your Drive folders. View a history of all medical summaries that have been provided by your clinician. 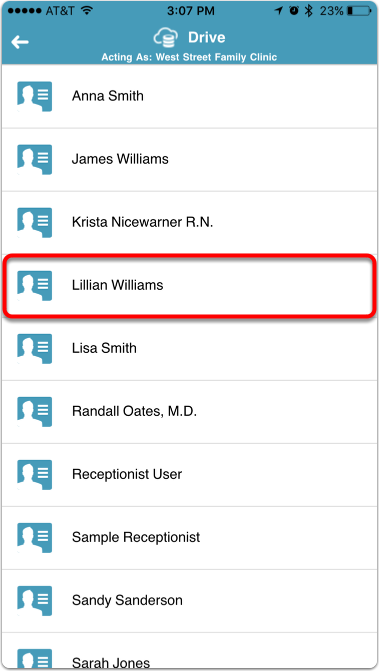 Store and save conversations with your clinic into your Drive folders. Save any file, fax, conversation, or attachment to a chart section folder within Drive. 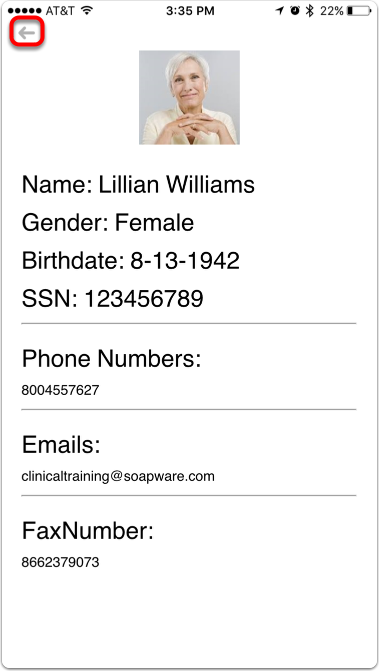 This makes the document or conversation accessible in the corresponding patients chart within the SOAPware EHR. Store and save clinical data that is received from patients in a HIPAA secure storage space. Store and save conversations with patients or colleagues into your clinic's Drive storage space. View a history of all medical summaries that you have uploaded to a patients myHEALTHware account. Send and receive faxes right within Drive making it simple to annotate and route to a patients chart. For more information about the future of myHEALTHware Drive, please visit: http://info.myhealthware.com/drive/. 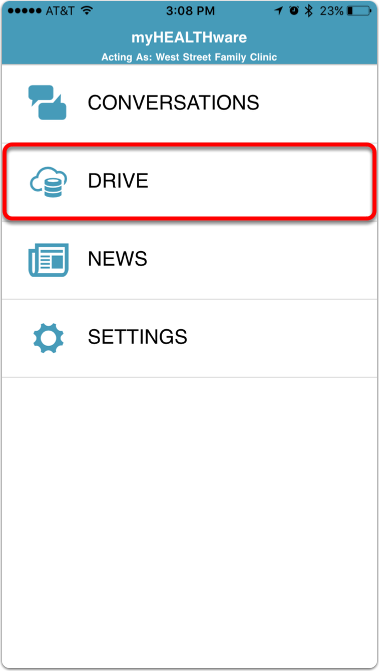 To access the clinic's myHEALTHware Drive, click on Drive from the main menu in the myHEALTHware app. A Drive folder will be created for all contacts in myHEALTHware. For clinics, this will include all patient and non-patient contacts. 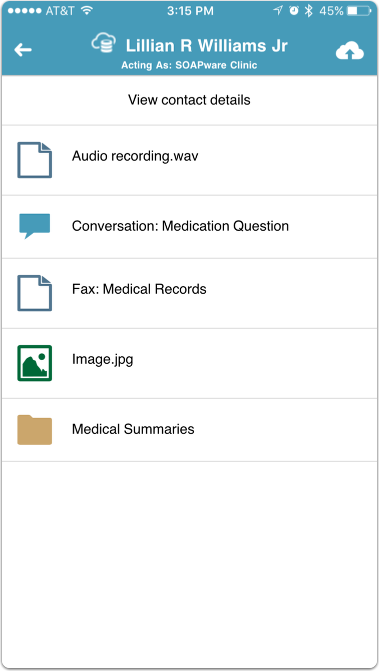 Each Drive folder can be used to store documents related to the contact, such as myHEALTHware conversations with the contact, lab results that were attached to a conversation, clinical summaries for the patient, etc. Your personal Drive will contain folders for all of your personal contacts. For clinics, your clinic organization drive will contain folders for all of your clinic's contacts, including your patients. To view the documents stored in a Drive folder/contact, tap on the item. Clinics: A patients Drive folder will contain any documents that have been saved to the folder from myHEALTHware, such as a conversation with the patient, attachments, faxes, and copies of the medical summaries that have been sent to the patient. You can also view the contact details by tapping on "View contact details". After viewing the contact details, click the back arrow to return to the Drive section.